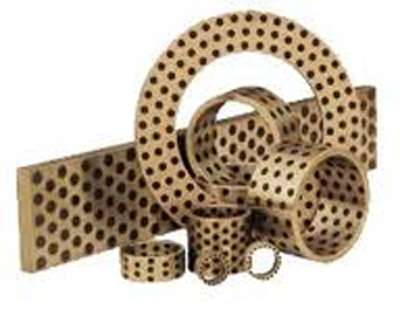 Isostatic Industries, Inc., a leading supplier of quality bronze bearings, has one of the world's largest inventories of bronze bearings in a wide variety of inch and metric sizes. 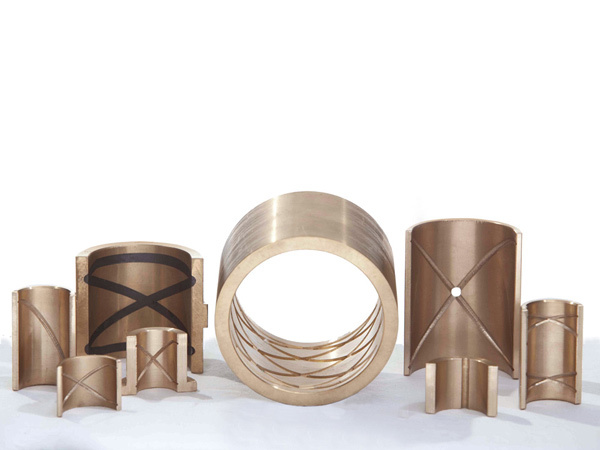 We offer a broad range of bearing types, from sleeve and flange to disc, plate and thrust, solid and cored bar in sintered, cast bronze and steel back-PTFE-lined materials. Our bearings can be oil impregnated, dry or graphite-filled to meet a broad range of application requirements. We offer a broad range of bronze alloy materials beyond our core powdered metal (SAE 841) and cast bronze (CA932 / SAE 660) products. A few of the other bronze alloys offered include high leaded tin bronze (CA 936 and 937), aluminum bronze (CA 614, 630, and 954), and manganese bronze (CA 863). Our processes include boring (minimum .0937") to turning (maximum 75") to finished machined lengths up to 50". We also provide milling, drilling, tapping, reaming, and centerless grinding, as well as special oils and dry and re-lubrication services. We have extensive expertise in grooving and offer a full range of groove styles - from simple straight and circular grooves to double loops and double figure eights. Plain or graphite filled grooves are available in minimum I.D. of .190" and minimum length of .09375" . Please contact us to learn more about how our bearings can benefit your business. Materials (Bronze Alloys) Below are the most common alloys - call to inquire about other materials. Groove selection can be influenced by many things such as operating temperature, type of lubricant, supplemental lubrication feed system, load etc. Any of the standard bearings listed in our catalog can be grooved, graphited, drilled or re-machined in many ways to handle of variety of requirements. Unless otherwise specified, the width & depth of the groove will be proportional to the wall thickness and the size of the bearing, and contained within the bearing. Special designs or a combination of standard styles illustrated below may be furnished if desired. We recommend a V-shaped groove whenever the design permits, as it allows full flow of the lubricant across the bearing service. Boundary Lubrication is where none of the load is supported by the lubricant. Bearings only periodically lubricated will at some time operate under these conditions. Speeds which are 10 s.f.m. or less will cause boundary lubrication: Suggested grooving: Double Loop or Double Figure 8. Mixed Film Lubrication is where the load is partially supported by the lubrication. Speeds from 10 to 25 s.f.m. will induce this condition. 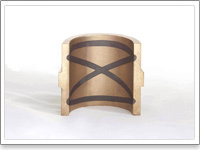 Most cast bronze bearings are in this category. Suggested grooving: Straight - good for long bearings. The groove should be located in the unloaded area of the bearing. 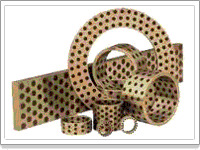 Circular - used when the location of load varies and a pressure fed lubricant system is present. Straight & Circular - applied in cases where the direction of the load varies and the lubricant is not pressure fed. Full Film Lubrication is where the load is separated from the bearing by a film of lubricant. A minimum speed of 25 s.f.m. will generally be needed. The same type of grooving used in mixed film will work in the full film application. Graphiting - Graphite lubrication on the I.D. face of the bearing will enable you to obtain long bearing life both at high operating temperatures, and in applications lacking a supplemental lubrication. Graphiting is accomplished by grooving the I.D. and then pressing graphite into the cavities under extremely high pressure. A film of lubricant is transferred to the shaft as it starts to turn. 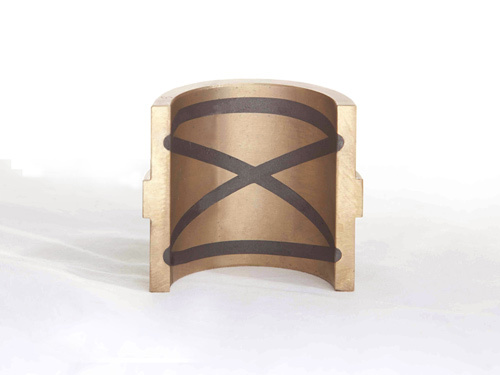 Any of our standard stock sleeve type bronze bearings, as well as custom bearings, are adaptable to grooving and graphiting. Many different graphiting styles are available, including plug type. The depth and width of graphite grooving depends upon the wall thickness, bearing diameter and other factors than may vary with an individual application. When using a graphite lubrication bearing, an allowance of .001" to .002" additional clearance is suggested. This extra clearance can be obtained by ordering the bearing with a larger I.D. or by reaming.